This grass-fed iberico shoulder ham is a product from the forelimbs of the iberico pig. It is characterized by its stylized form, with its black hoof and soft and shiny fat. 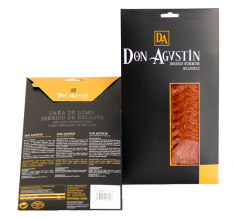 The taste is exquisite and delicate on the palate.In Spanish, this product is known as, "Paleta ibérica de cebo de campo Revisan Ibéricos loncheada." 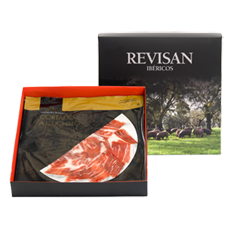 Format : This grass-fed iberico shoulder ham comes vacuum-packed on a cardboard tray inside the outer carton. Storage : This grass-fed iberico shoulder ham should be refrigerated. 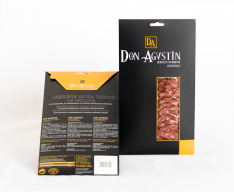 Once it’s been opened, we recommend you keep it in the refrigerator in a rigid plastic container.